I went to Sarikei (about 1 hour from Sibu) just to eat this Asam Tom Yam Big Prawn Noodles in a Coconut. I always try to go when I’m back. I asked the chef if I could film him cooking and he was kind enough to say yes. He even cleaned up his workstation! Thanks Chef Huang! He’s been doing this for 16 years too. I think this is the best video I’ve done thus far – took me two days (not continuously of course) to edit, while I usually just stitch and cut in a few hours in Premiere CC. I also added a few new effects and some music, although the music seems a little hyper for driving. It’s my workout tunes, I’ve been listening to it while torturing myself every day so I got quite attached to the song. Turn on CC for English subs, the video is in Mandarin. 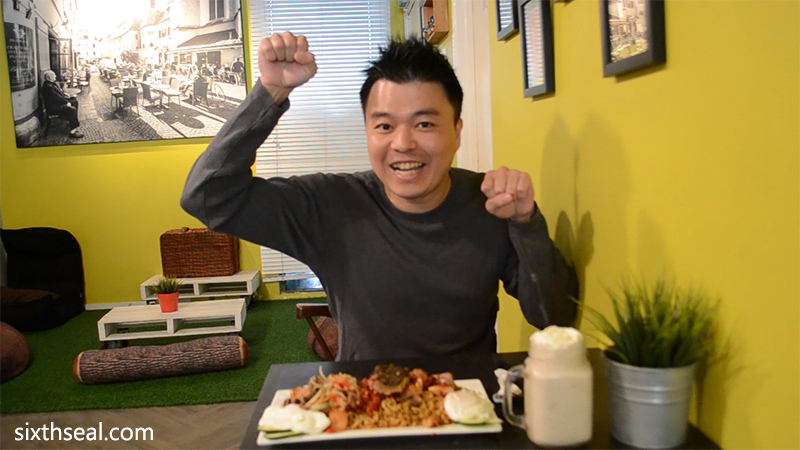 Sarawak Laksa Mukbang – eating the entire menu! Yeah, I tried to eat the entire menu of Aloha Cafe’s Sarawak laksa. It’s probably the best in Sibu – or at least I haven’t found a better one yet. There is the Small (RM 5), the Big with Large Prawns (RM 7), and the Big with Huge Prawns (RM 10). The last two is the same size, only the shrimp is bigger for the latter. I had a guest this time, who ate one bowl. Someone asked me why my teeth look like that in Facebook – those are actually made so my Invisalign aligners has something to hold on to and push my teeth straight. Speaking of which, I need to drop by Imperial Dental Bangsar for my next set when I’m back in KL. I’m still wearing them, but obviously I take them off to eat meals. That’s one of the best things about Invisalign, the fact that you can take them off. I’m going to Sarikei tomorrow to do one on Glory Cafe’s Tom Yam Big Prawn Noodles in a Coconut. I’m just going to eat one though so it’ll be more like a normal mukbang instead of an eating challenge. I don’t think it’ll be nice to try to eat large amounts coz it takes so long to get through the large prawn that it’ll take ages to eat 2-3. It’s also a soup dish so the same noodle expanding problem might come into play. I already have a vision of how I’m going to do the video, so let’s hope it turns out the way I imagined it. I like doing this, I think I’m getting better each time. I ate this monstrous amount of food and managed to finish everything. The Jumbo Platter has 4 packets of Indomie + 4 toppings + 2 eggs. It’s quite a lot of food. I didn’t think I’ll be able to finish it since I haven’t been able to put down 4 packs in a long time…much less with sides. However, after a significant amount of preparation (actually, I just skipped breakfast and lunch) I successfully ate everything on the plate + 2 milkshakes. People have given me some great feedback about my YouTube videos and I’ve been told that I have been slightly wooden in past videos. This one has 30% more genki/pep. It’s just coz I’m feeling a lot better now – the previous Big Hug one was filmed when I was still feeling a significant amount of Suboxone withdrawal. I was not myself. I’m still not fully back to normal but it’s very close now, I’m feeling better and better each day! I apologize for the blurry focus at the beginning – I had set the focal area to a wrong part and only fixed it in the middle when I went to check. There are also 3 cuts in the video but I’ve learned a few tricks since so it shouldn’t be too visible. I used the new morph tool in Premiere CC to make the transitions better. I had known about this before filming and arranged each cut as I was leaning in to take a sip of the milkshake and go back to the same position as I went back. It sounded like a good idea but in reality Premiere needs your full face to be in for better results. I’ll remember that for next time. It was a bit of a challenge to finish everything too. I asked one of the friendly waiters if he could turn on the lights and turn off the stereo so I could record. Now I know why all the mukbang people say doing on-site videos is hard, you sometimes have to impose a little so I try to go during off-peak hours. It was still full on one side then so I couldn’t sit where I wanted. I did move a few tables for better lighting though, so it takes bit of coordination to do these things better. Hope you enjoy the video. Thanks for watching.